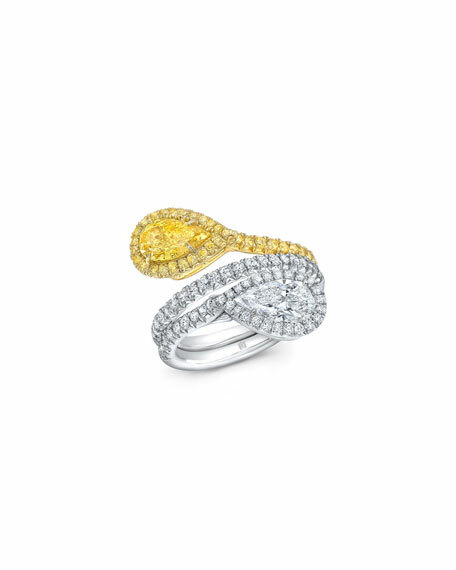 Rahaminov Diamonds bypass ring in platinum and 18-karat yellow gold. Fancy pear-shaped D/SI2 white and VS2 yellow GIA-certified diamonds in east-west prong settings. Pavé white and yellow diamonds trim stacked band. 0.93 total pear-shaped yellow diamond carat weight. 0.90 total pear-shaped white diamond carat weight. 0.54 total pavé white diamond carat weight. 0.33 total pavé yellow diamond carat weight. Rahaminov Diamonds is an internationally recognized diamond house known for timeless jewelry designs and an impressive diamond inventory. The exquisite designs, which feature rare and important diamonds, are brought to life through unparalleled craftsmanship and attention to detail. 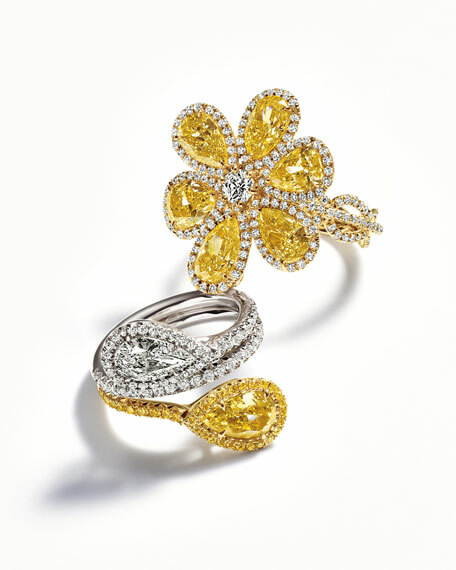 For Rahaminov, a diamond is as rare as the woman who wears it a sentiment that stems from the fact that the pieces are crafted for women, by women. 18K Gold Africa Necklace, 17"